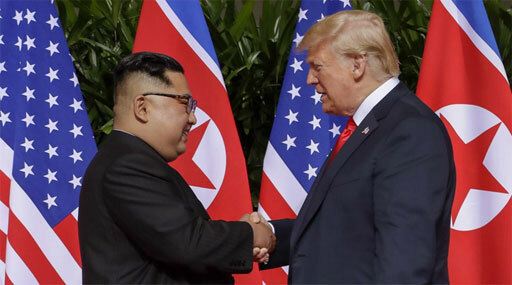 After a half-day of "intensive" meetings, Donald Trump and North Korean leader Kim Jong Un publicly signed a joint statement Tuesday agreeing to pursue the denuclearization of North Korea although some described the document as "brief and vague." As part of the agreement, Trump promised to suspend joint military exercises with South Korea. The pact came at the end of a historic half-day round of negotiations that marked the first time a sitting U.S. president had met with his North Korean counterpart. "From the beginning, we got along," Trump later told reporters. Trump also confirmed military exercises involving American and South Korea forces would be put on hold for now. He said sanctions imposed against the Kim regime would not be removed until "we are sure that the nukes are no longer a factor." While the agreement fell short of outlining concrete measures that would lead to Kim giving up his nuclear weapons program — the stated long-term goal of U.S. negotiators — it gave Trump and Kim a piece of paper to point to as a sign of progress and a symbol of goodwill. Trump told ABC News chief anchor George Stephanopoulos just hours after the summit meeting that he believes North Korea will denuclearize because of his newly-found "special bond" with Kim Jong Un. At a press conference after the meeting of the two leaders, Trump acknowledged that he has invited Kim Jong Un to the White House and the North Korean leader has accepted. Trump also shared that he has no notes from the summit because he doesn't need them. "I don't have to verify because I have one of the great memories of all time."